Freezing Bed Bugs: How Does It Work? Bed bugs are small bodied insects, but once they infest a home, apartment, hotel, hospital, or other structure, they can quickly become a big problem. If you’re researching bedbugs you’ve probably heard by now that a highly effective means to exterminate these pests is by freezing them. Pest Management Professionals (PMPs) across the country are using Cryonite to eliminate these critters, and for good reason. Our patented carbon dioxide snow kills bedbugs and other pests on contact. Even though we have a great solution to bed bug problems, we understand the curiosity people have over these annoying pests. At Cryonite, we wanted to provide you with answers to common questions people routinely ask us when their home or business becomes infested with bed bugs. An adult bed bug. Where do they come from? Is freezing an effective solution? People often wonder about the source of their infestation. In many situations, it’s nearly impossible to give the definitive source because these pests are notorious hitchhikers. Bed bugs can be found in any part of the world, and may harbor within luggage, handbags, clothes, and backpacks. If a child goes to school with bed bugs in their backpack or on their clothing, it can quickly spread to other homes within a couple days. Going to the movie theater could result in a few bed bugs crawling onto your clothes and hiding until you get home. Bed bugs have also been found in taxis, buses, retail establishments and restaurants. What do bed bugs do once they get inside a home, hotel room, or apartment? It’s obvious, and it’s the most disturbing thing about bed bugs, but they survive by feeding on blood. But bedbugs don’t come out of hiding without reason.. They usually only come out to feed, and that happens about once a week. They like to hide near their source of food, so you can usually find them 5-10 feet away from where they are getting their meals. 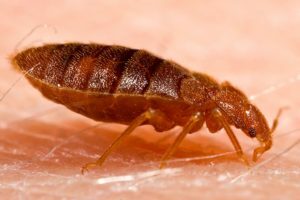 To make them even more of a threat, some bedbugs have lived up to a year without a meal, and only two bed bugs can be the beginning of a larger infestation. Most conversations about bedbugs end up coming down to one idea: what is the best and most efficient way of killing them? Bed bugs are one of the most difficult pests to exterminate completely, so we highly suggest that anyone with a bed bug problem consult a professional. There are do-it-yourself methods that you can try (such as vacuuming routinely, encasing your mattresses, and placing glue monitors underneath every leg of a bedframe), and while these methods might help to contain an infestation, they are usually not enough to eliminate the problem. Heat treatments have become popular over the years, but they are expensive and almost always should be used in conjunction with a residual treatment. When treating for bed bugs with heat the air where bedbugs are living must be heated up to at least 118 degrees, and this heat needs to penetrate far enough down into whatever hole or crevice they are hiding in for it to be effective. If not, the bedbugs won’t be killed. This is why most professionals that use heat treatments also include residual treatments. Residual applications of insecticides are a primary way of killing bed bugs but these cannot be applied to some sites where bed bugs might be found, such as electronics, stuffed toys, backpacks, etc. Fumigation is effective in eliminating bed bugs but is expensive, and people need to vacate their home/business for 2-3 days. Bedbugs have also shown resistance to some pyrethroid insecticides. The last alternative is freezing. Freezing with Cryonite is a quick, safe, and effective way to kill bed bugs. Cryonite is safe to use on electronics, books, toys, clothing, bedding and other sites where bed bugs may harbor but where residual treatments cannot be applied. Combined with vacuuming and residual treatments into bed bug harborages like wall voids and cracks, Cryonite can be the key component in a fully integrated bed bug control strategy. The Cryonite system, proven enemy of bed bugs. We’re glad you asked! 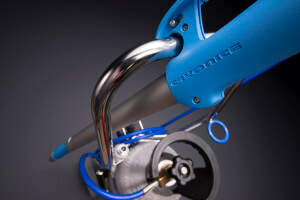 At Cryonite, we want to help people, and our equipment does exactly that. Our technology has been tried and tested, and the results are unanimous. What happens is this: carbon dioxide snow (or dry ice snow), which is about -110° F, comes out of the nozzle and is sprayed onto bed bugs or other insects. The bed bugs/insects are killed instantly by freezing with no residue remaining after application. It is non-staining and non-damaging to most any object or surface allowing it to be applied to most any site bed bugs or other insects may hide. Hopefully we’ve answered your questions about bed bugs and the technique of freezing them as a pest control method. If you have any questions or would like to learn more about the Cryonite method, contact us—we’d love to help!